Earlier this week Michael and I went to Hong Kong overnight for business. We left our boys in Macau (with someone, not alone! ), which resulted in a parenting first for us: the first time we were both in a different country (or Special Administrative Region if you please), from our offspring. I suppose knowing we were just a one hour ferry ride (or $400 USD, 14 minute helicopter ride) away kept us from feeling any little worry that we could have. 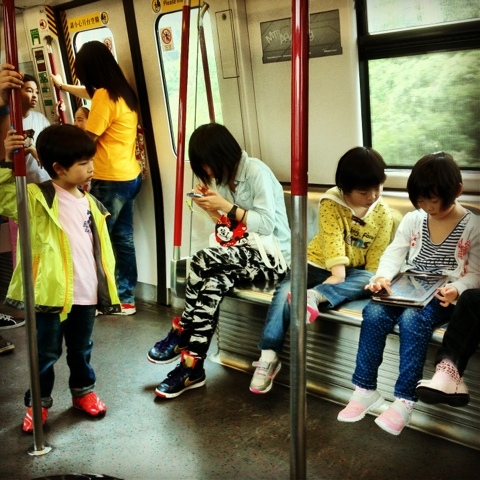 While riding the MTR train with all the morning commuters, I saw this group of children on their way to Hong Kong Disneyland. The girls were passing the time away playing games on a tablet while the little boy, part of a different group, kept creeping closer and closer. Have you ever seen such longing?